Charles Brandon, 1st Duke of Suffolk was born in 1484.3 He was the son of Sir William Brandon and Elizabeth Bruyn. He married, firstly, Anne Browne, daughter of Sir Anthony Browne and Lady Lucy Neville.4 He married, secondly, Lady Margaret Neville, daughter of Sir John Neville, 1st and last Marquess of Montagu and Isabel Ingaldesthorpe, before February 1506/7.5 He married, thirdly, Mary Rose Tudor, daughter of Henry VII Tudor, King of England and Elizabeth Plantagenet, circa 31 March 1515 at Palace of Cluny, Chapel, Paris, FranceG.3 He married, fourthly, Katherine Willoughby, Baroness Willoughby de Eresby, daughter of William Willoughby, 11th Lord Willoughby de Eresby and Maria de Salinas, on 7 September 1534. 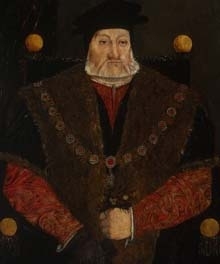 He died on 22 August 1545. [S11] Alison Weir, Britain's Royal Families, page 150. [S6] G.E. Cokayne; with Vicary Gibbs, H.A. Doubleday, Geoffrey H. White, Duncan Warrand and Lord Howard de Walden, editors, The Complete Peerage of England, Scotland, Ireland, Great Britain and the United Kingdom, Extant, Extinct or Dormant, new ed., 13 volumes in 14 (1910-1959; reprint in 6 volumes, Gloucester, U.K.: Alan Sutton Publishing, 2000), volume XII/1, page 460. Hereinafter cited as The Complete Peerage. [S18] Matthew H.C.G., editor, Dictionary of National Biography on CD-ROM (Oxford, U.K.: Oxford University Press, 1995), reference "Charles Brandon". Hereinafter cited as Dictionary of National Biography. [S6] Cokayne, and others, The Complete Peerage, volume XII/1, page 461. [S6] G.E. Cokayne; with Vicary Gibbs, H.A. Doubleday, Geoffrey H. White, Duncan Warrand and Lord Howard de Walden, editors, The Complete Peerage of England, Scotland, Ireland, Great Britain and the United Kingdom, Extant, Extinct or Dormant, new ed., 13 volumes in 14 (1910-1959; reprint in 6 volumes, Gloucester, U.K.: Alan Sutton Publishing, 2000), volume XII/1, page 118. Hereinafter cited as The Complete Peerage. [S6] Cokayne, and others, The Complete Peerage, volume XII/1, page 119. Cavaliere Giovanni Vimercati was born on 21 December 1788. He married Maria Luisa Carlota di Borbone, Principessa di Parma, daughter of Luigi I di Borbone, King of Etruria and Maria Luisa de Borbón, Infanta de España, on 19 February 1855. Donata von Reiche was born in 1992. She is the daughter of Berhard Ernst Dieter von Reiche and Friederike Thyra Marion Wilhelmine Dorothea von der Osten. [S6] G.E. Cokayne; with Vicary Gibbs, H.A. Doubleday, Geoffrey H. White, Duncan Warrand and Lord Howard de Walden, editors, The Complete Peerage of England, Scotland, Ireland, Great Britain and the United Kingdom, Extant, Extinct or Dormant, new ed., 13 volumes in 14 (1910-1959; reprint in 6 volumes, Gloucester, U.K.: Alan Sutton Publishing, 2000), volume XII/1, page 119. Hereinafter cited as The Complete Peerage.